The Gordon Buehrig designed Auburn 851 of 1935 was powered by a 279 cubic-inch eight-cylinder engine of 115 hp (150 hp if fitted with the Schwitzer-Cummings supercharger) designed by Augie Duesenberg. Each Auburn 851 was test driven to a minimum of 100mph before being sold. Additional information about the Auburn 851 Roadster Graphic: Auburn began making cars in 1903, after the depression the company was rescued by William Wrigley who recruited Cord as his General Manager. 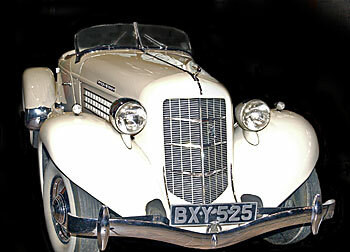 Siteseen Ltd. are the sole copyright holders of this Auburn 851 Roadster picture, unless otherwise stated. We only authorise non-commercial picture use and particularly encourage their use for educational purposes. This Auburn 851 Roadster Fast Car picture is not in the Public Domain. 1) www.educationalresource.info must be credited as the copyright holders wherever this Auburn 851 Roadster fast car picture is used. 3) Use of this Auburn 851 Roadster fast car picture, or any of our pictures on websites re-distributing copyright free material is strictly prohibited.